Fords Pony car, the Mustang was first introduced in April, 1964. 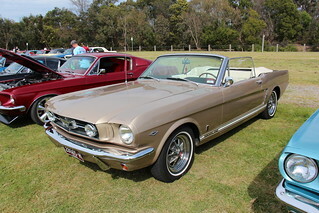 In 1964, only the Hardtop and Convertible were available. For 1965, not only was the Fastback introduced, the sporty GT equipment group was now available on all three body styles. The GT got the V8 standard, five-dial instrumentation, fog lamps, rocker panel stripes, larger sway bars and disc brakes. Another option was an interior decor group; the 'Pony' Interior. It got embossed running ponies on the seat trim, five gauge instrument panel, woodgrain steering wheel, and woodgrain on the instrument cluster and glovebox. Shelby American built performance versions of the Mustang. In 1965 GT Fastbacks were delivered to Shelby, the back seat was removed, turning the Mustang into a 2 seater 'sports car' (able to race under the SCCA rules), engine power was increased by 35hp, suspension improved and fibreglass hood. All 1965 Shelby GT350s were Wimbledon White with Guardsman Blue Stripes. 1965 Engines; 120hp 200 cu in 6 cyl (T code), 289 V8s came in 3 specs; the base 200hp 2 barrel (C Code), 225hp 4 barrel (A Code) and the high performance 271hp Hi Po 289 (K Code).